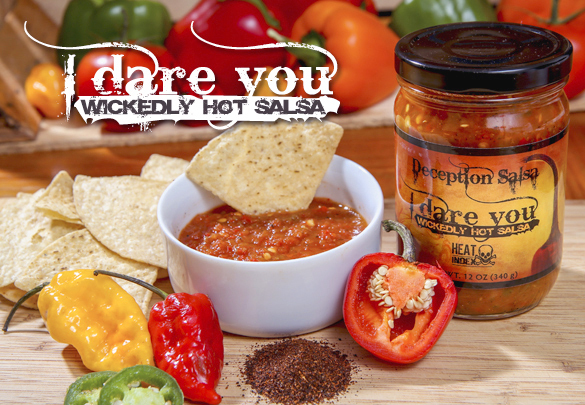 Deception Salsa – I Love It Spicy! I met Deception Salsa at the Dc Metropolitan Food & Entertaining Show this past November. I was very impressed with not just the taste of their salsa line, but also the whole look of their brand. From the names (Girly Girl (mild), Entice, Tease, Insanity & I Dare You) to the labeling and design. The cherry pepper in the ingredients is a star that I have never experienced before or at least to this level of awareness. The flavor is different, but not in a bad way. Whilst there is some sweetness in their milder salsas, the hotter versions all shine to this reviewer and the blend is such an enjoyable burn I am shocked no one has thought of it before now. This is the reason I gave Deception Salsa a Lenny Award for best Salsa Product line of the year. We have 2 of their salsas for review. 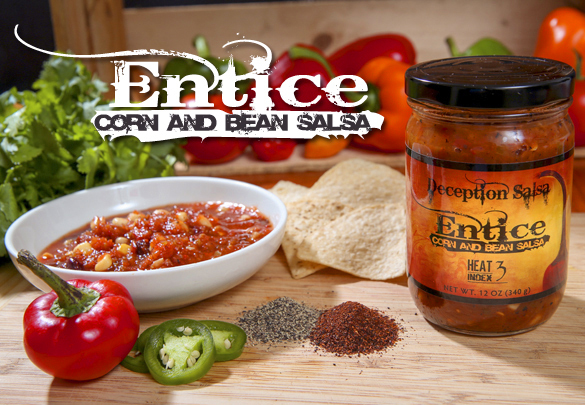 This Entice one which is a very sweet mild corn and bean salsa and their hottest I Dare You Wickedly Hot Sauce which we will post a week from now.